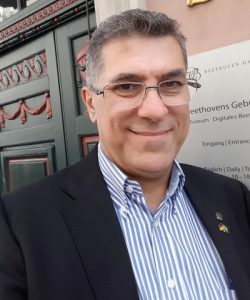 Munir Skaf graduated in physics from the University of Campinas (UNICAMP) in 1984 and obtained a PhD in physics from the State University of New York at Stony Brook in 1991 under the supervision of Professor George Stell. From 1991 to 1993, he was a postdoc at Professor Branka Ladanyi’s group in the Chemistry Department at the Colorado State University, in Fort Collins, where he conducted research on the dielectric properties and solvation dynamics of associating polar liquids using Molecular Dynamics computer simulations. Munir Skaf served as an Assistant Professor in the Chemistry Department at the University of São Paulo in Ribeirão Preto from 1993 to 1996 and then joined the Institute of Chemistry at UNICAMP, where he has been Full Professor since 2010. From 2000 to 2001, he was a visiting scholar at the Institute of Theoretical Chemistry at the University of Texas, Austin. During that period he worked with Professor Peter Rossky in conducting polymers and solvated electron systems using hybrid quantum-classical simulation techniques.Munir Skaf’s research interests reside in the study of molecular mechanisms underlying structural and dynamical features of complex molecular systems using classical and quantum Molecular Dynamics simulations and statistical mechanics. In the last ten years or so, the Skaf group has devoted attention to simulate nuclear hormone receptors, human hemoglobin, and other proteins of relevance to human health and drug development. More recently, his group has been also dedicated to understanding complex biomolecular systems of relevance to the productionof environmentally benign bioenergy such photosynthetic complexes, cellulases and other carbohydrate modifying enzymes with aims at producing cellulosic ethanol and other biofuels from sugar-cane bagasse and other livestocks, as well as molecular aspects of plant cell wall architecture.